GMcolor is not just here to provide home improvements; we also cater for the corporate sector throughout Kildare working for many businesses. No matter what the size of the job you are looking for; a small corner shop to a multi-story stadium, we can help. We can provide your company with fast quotations and accurate completion times. 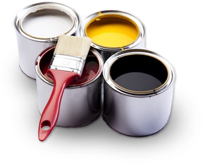 Our decorators are extremely professional and organised, and we can provide you with as many needed to complete the task in order to speed up the process. Check out the feedback we’ve received from previous clients to see how highly rated we are. Your happiness is our concern and we never cease to provide successful jobs to all our customers. The way in which your business is presented, whether it’s the buildings or furnishings, reflects on how customers will perceive you. Making a good impression is a general rule of thumb for any thriving establishment so creating an environment that is both comfortable yet professional is very important. We can help discuss different options with you from choice of designs, to colour schemes, and even refurnishing ideas. Whatever area of decor you need help with don’t hesitate to ask. To find out how we have helped other businesses call us on 087 916 2059, or send an email to info@gmcolor.ie. You can also use this price calculator to receive a quick quotation.